It’s been a while (since April 2013) but I’m back with my latest newsletter and lots of news so I hope it’s been worth the wait! Main Article – What Happens at a Juggling Club? When I first learnt to juggle from a set of instructions in a tube with 3 juggling balls on Christmas Day 1993, little did I know that there was a thriving juggling club just 10mins walk from my house! 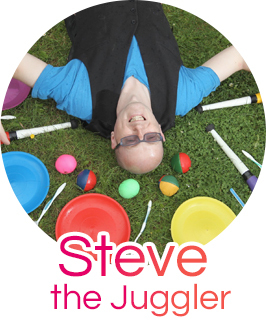 Not many people know that there are Juggling Clubs all over the world, and currently 65 listed in the UK on the Juggling Edge website, so the chances are that you might be near one also! You can find the rest of this article here – What Happens at a Juggling Club? TEDTalks by Jugglers and Performers Playlist page added. Be inspired by several of the worlds finest performers delivering their presentations at the TEDTalk conference (including Jay Gilligan). Last year was the first in over a decade where I made a loss on the store. I only had a handful of sales for most months, and for this reason, I have had to cancel my Merchant Account status (the ability to accept credit/debit cards over the phone). People can still pay by credit/debit card through the online store, by clicking on the PAYPAL payment option. Don’t worry as you are not required to register any details with PAYPAL, but they can provide a quick checkout for me with the ability to accept Cards with me paying a percentage of commission to them rather than the flat fee of £60 per month which I have been paying! Royal Mail did their best to eat into profits, with several large and relatively inexpensive items (such as my Twin Jumbo Catch-it Cones) having to be removed from my online store due to the postage costing almost twice as much as the items retail price! In 2014, I hope to do a lot more offline selling, and spend the year reducing my stock. This is your chance to grab a bargain! Over 100 products being phased out, and many are reduced below the wholesale price. You can find most of them listed in the Bargain Basement Section of my online Jugglingworld store (UK only). An opportunity to take over part of a shop in my local High Street has made itself available and is one potential idea, and I have just bought a price gun so people won’t need to look at a table of equipment and then consult a pricesheet to work out the cost of each individual item!